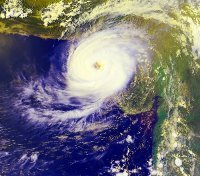 Ten people drowned and thousands fled to higher ground as a tropical cyclone lashed Pakistan's coastline. Navy ships rescued 75 people from four floundering vessels and were searching for more boats caught in the rough seas with the help of helicopters, said Navy spokesman Lt. Com. Salman Ali. Cyclone Yemyin hit parts of the coastline of Baluchistan province at about noon with winds of up to 57 miles (91 kilometers) an hour, said Qamaruz Zaman, director-general of the Pakistan Meteorological Department. Rain-swollen rivers flooded several coastal districts, killing at least 10 people, including four children, said Raziq Bugti, spokesman for the provincial government. Floods washed away some bridges and part of the main coastal highway, causing lengthy traffic delays. Hundreds of villagers clutching possessions filed past the vehicles in the opposite direction. In the hills, spillways were opened to release the water pressure on two dangerously full dams, Bugti said. Relief efforts were hampered with roads and telephone lines severed in nine districts of the province. Officials said the storm's intensity was decreasing and would subside by evening, but not before dumping heavy rains that could last through the night. Located on the same Arabian Sea coastline, Pakistan's largest city of Karachi suffered torrential rains and thunderstorms, which killed at least 228 people Saturday. Rains and flooding also killed 38 people over the weekend in neighboring India, raising the death toll to 129 since the monsoon season set in four weeks ago, according to official reports. In Pakistan, warnings of coastal flooding prompted many to flee in panic. Most of the 120,000 residents of the southwestern port city of Gwadar moved to higher ground, Mayor Abdul Ghaffar Hoth said. People from several smaller towns nearby loaded possessions onto camels or into cars and headed for the hills, he said. "We have imposed an emergency in the district and asked the army and other forces to be on alert," Hoth said. On the high seas, the navy rescued 19 fishermen from two sinking boats and were looking for others reported missing, the navy spokesman said. Another 56 crew members were plucked from a stricken freighter and a tug that later sank, Ali said. "We also have distress calls from two freighters but they are stable platforms ... Priority is being given to small vulnerable boats in rescue operations, then we will move to the bigger ships," he said. In Karachi, city authorities were scurrying to repair power cables snapped by the storm, which have caused widespread power outages. Enraged residents in the sweltering city took to the streets over the weekend to protest, torching vehicles and blocking major roads in the country's economic hub. One person was killed during the riots, police said.